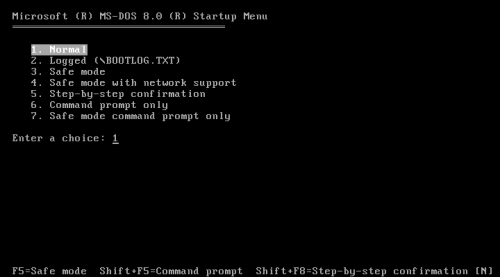 So my question is, has anyone managed to find a way to get the old DOS commandline out of ME and stick it into the DOS 6.22 installer? 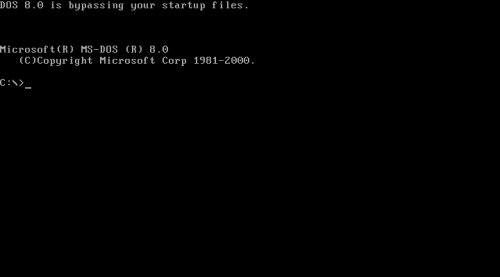 In other words, has anyone found a way to install MS-DOS 8.0 without ME on top of it? You can use a Windows ME bootdisk to boot into DOS 8. The russian website http://www.multiboot.ru/msdos8.htm has an instruction how to modify the IO.SYS and COMMAND.COM from Windows ME DOS/MS-DOS 8 to use it on the hard disk. IO.SYS and COMMAND.COM are from the Windows ME Retail CD, which is bootable. The XMS driver (HIMEM.SYS) is integrated into IO.SYS. IO.SYS was compressed by MS to make it smaller. SYS.COM is from Windows 98SE. FORMAT.COM is OFORMAT.COM from the Windows XP Professional installation disc. "X:\SUPPORT\TOOLS\DEPLOY.CAB"
You cannot use Windows 3.x in the Enhanced Mode, because its XMS driver is causing some problems. In addition you cannot load EMM386.EXE or other EMS memory manger. DriveSpace is not supported and DBLSPACE.SYS/DRIVESPACE.SYS will not load. I have read the instruction and made a modification of IO.SYS and COMMAND.COM. I have modified the MS-DOS system files with HxD Hex Editor. -Extract the MS-DOS 8.IMA diskette image. -Start VirtualBox and boot from it. 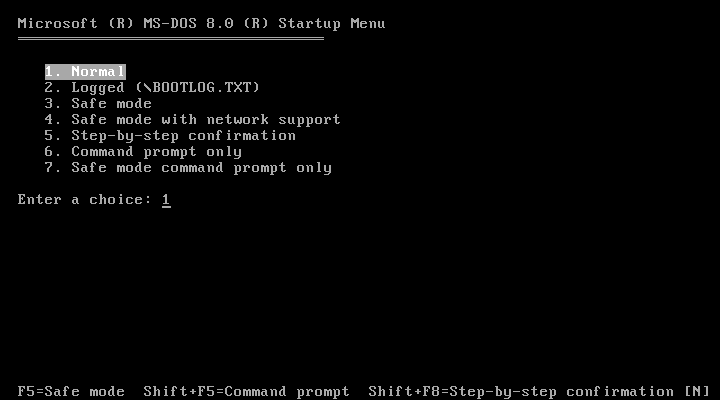 Can someone help me to modify IO.SYS from MS-DOS 8 to start Windows 3.x into the Enhanced Mode without problems? Last edited by Windows 386 on Sun Jan 20, 2013 1:06 pm, edited 1 time in total. The disk image is in diskcopy.dll, in both the system32 and syswow64 directories. I think you need to copy the files. 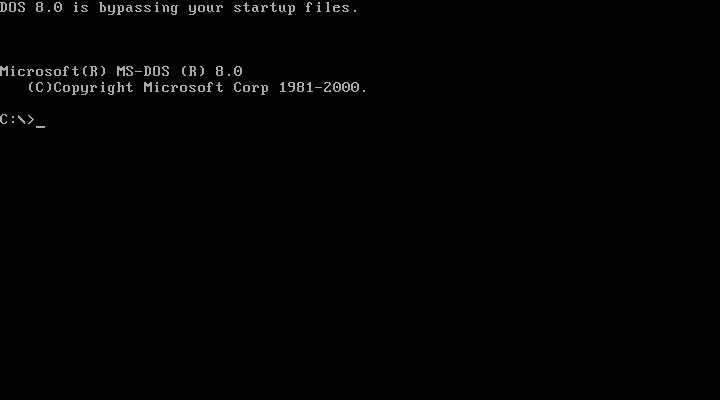 The files in DOS8 folder aren't neccessary, the system will still run if the files aren't present. You are right. I should create a Boot CD. I deleted the old link, because it is obsolete. Last edited by Windows 386 on Mon Jan 28, 2013 10:08 pm, edited 2 times in total. Hello 0ffer. Thank you for your instruction on multiboot.ru. Do you have an idea how to run Windows 3.x in the Enhanced Mode under MS-DOS 8? I know there was a Win3xStart path for uncompressed IO.SYS. I used it and Windows 3.x does not show the message about the compatibility on MS-DOS 8. But the XMS driver from IO.SYS makes some problems. I've done a heavily modified version of this too, although not scripted. Mostly consists of deversion and some utility replaces.